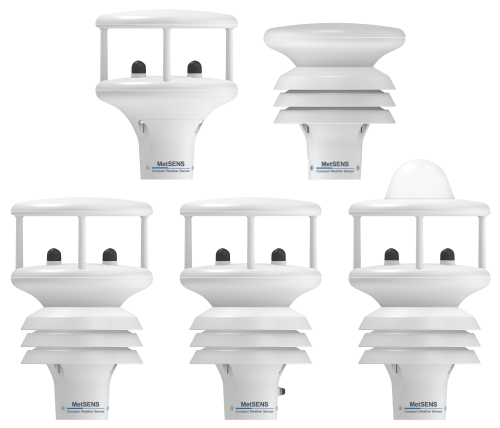 Our new MetSENS advanced weather sensors give you the high-quality measurements you need in a compact size. These sensors incorporate all the measurements required by demanding applications where high quality and performance—at an affordable price—are important. 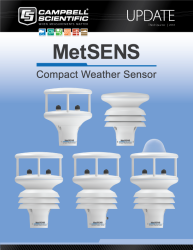 The MetSENS compact weather sensors feature a range of combined instrument configurations, to suit a variety of application requirements. The sensors feature no moving parts (for durability), an integrated design (to take less space and reduce cost), and ease of installation. There are MetSENS models available with several combinations of measurements, including wind speed, wind direction, air temperature, relative humidity, barometric pressure, and precipitation. Output options are RS-232, Modbus RTU over RS-485, and SDI-12—this gives you compatibility with a wide range of products, including all Campbell Scientific dataloggers. The quality and reliability you expect from Campbell Scientific are built into these rugged, compact sensors.